All4Israel - Security guard Youssef Ottman was one of three victims murdered in the Har Adar terrorist attack. 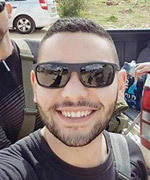 September 26, 2017 - Civilian security guard Youssef Ottman, 25, of the village Abu Ghosh near Jerusalem, was one of three victims killed in a terrorist attack in Har Adar. The terrorist held a work permit allowing him to work in the settlement, but when he aroused the suspicions of the security personnel he drew his weapon and began firing, killing Ottman, Border Policeman St. Sgt. Solomon Gavriya and fellow security guard Or Arish. Ottman had served in an elite Border Police unit and was saving his salary as a security guard to pay for his university tuition. Friends and family remembered him as being friendly and compassionate, beloved by all. Youssef Ottman is survived by his parents and siblings, including a sister who was married last week. Accompanied by thousands of mourners, he was laid to rest in the Abu Gosh cemetery.